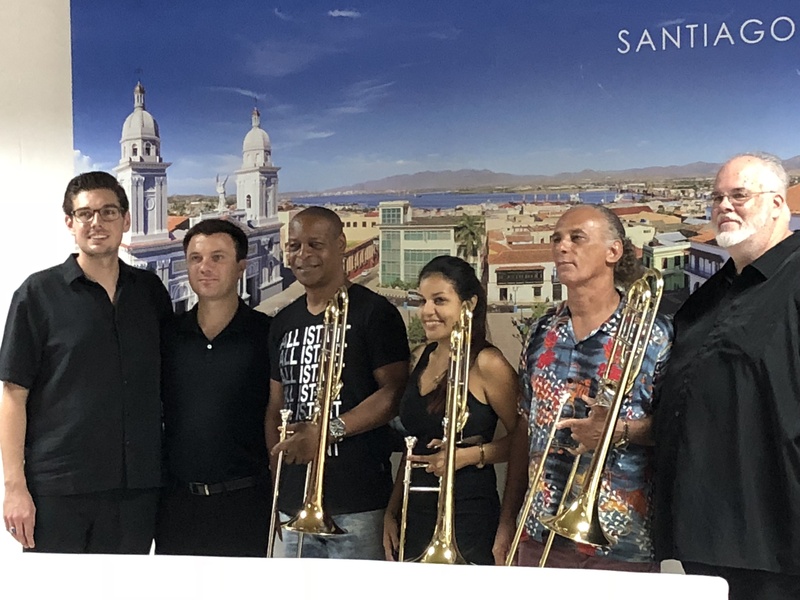 Faculty from four universities joined forces with jazz musicians in Santiago de Cuba in September for the Cuban premiere of a new work for big band, Cuban Pictures at an Exhibition, inspired by Modest Mussorgsky’s famous Pictures at an Exhibition. Penn State was represented by faculty members Mark Lusk (trombone), David Stambler (saxophone), Velvet Brown (tuba), and Mark Marcinko (drums), graduate student Wade Judy (trombone), and alumni Alex Mann (saxophone) and Kaitlyn Lusk (voice). The work was conceived by Mark Lusk, Mike Davison (University of Richmond), and Danny Guzman (Conservatorio Esteban Salas in Santiago), with each of six movements accompanied by a painting that inspired the music. The performance was part of the Santiago de Cuba Jazz Festival, which also included jazz combo performances. Traveling and performing with the group were faculty from SUNY Fredonia, Illinois State University, and Christopher Newport University. Prof. Davison has been traveling to Cuba for over twenty years, studying and promoting Cuban music and culture. Penn State faculty, alumni, and students have joined Davison for the past four years - teaching and performing in Cuba. Under Mark Lusk’s leadership, the groups have shared more than their talents - providing much-needed musical supplies to their Cuban partners. In October, Lusk presented to conservatory students and teachers three trombones, a clarinet, flute, piano tuning kits, and many other musical supplies.